Radut's Cube is the missing link between Soma Cube and Rubik's Bricks. The puzzle uses eight pieces each of two colors, and having the same volume but different shapes and pairs of colors. Two of the pieces have the same shape but different colors. The pieces are generated from a cube by detaching a 1/8 cube (or a prism) and then gluing it back in a different position. The target is to arrange the pieces to obtain a cube or other symmetrical shape but the colors must alternate as on a chess board. There are many possible combinations but only a few are correct solutions. The average time to solve the puzzle should not exceed 30 to 40 minutes. The puzzle can be made by wood in two versions. Both cube versions have only eight pieces generated from a cube and the solution is also a cube. Versions with more pieces (for example 27, 64, 125 pieces) are much more difficult to solve. 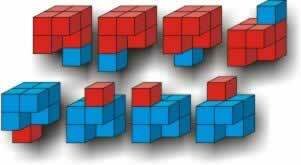 The pieces are generated from a cube by detaching a small cube which is 1/8 of the initial cube volume. The pieces are generated from a cube by detaching a prism. This version is the same as version 1, except that the piece-cuts vary.